Is something not working the way it’s supposed to? Are you having problems with the license or activating your copy of the plugin? Do you have any questions about UnderConstructionPage? Contact our friendly support, they’ll respond ASAP! There are several ways of contacting support. 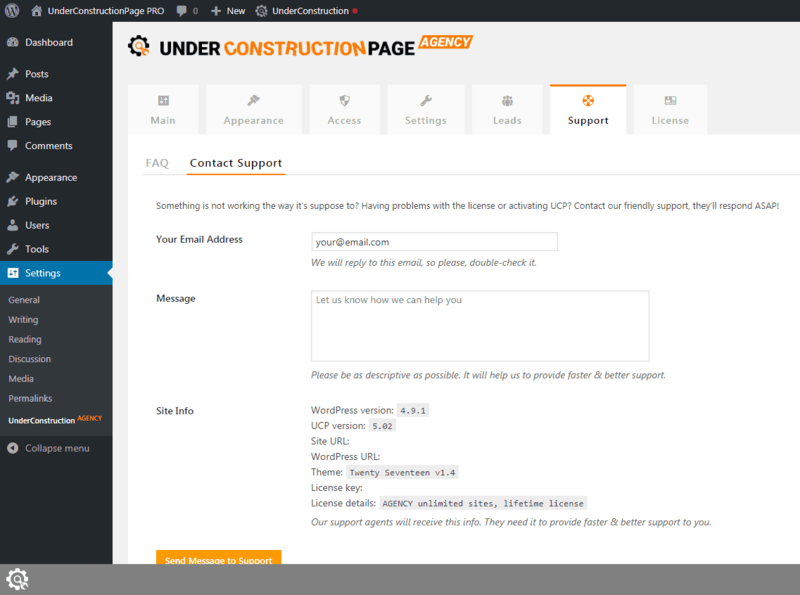 The best and fastest way to contact support is by going to Settings -> UnderConstruction -> Support tab -> Contact Support. Use this option whenever possible. Write a message. Please be as descriptive as possible. Basic information about your site and license will be attached to your message. This information is important to our support agents who will be able to work better and resolve any issues much faster. If you can’t use the contact form in the plugin, please go to our contact page. Fill in the form and send us a message. You can also give us a shout @webfactoryltd or email us directly.